I’m delighted to share the details of our annual Gerry Guthrie & Friends Weekend. In 2019, From April 5th – 7th we will be taking our weekend West, to the stunning Four Star Diamond Coast Hotel. This hotel is in a perfect location for you to visit Mayo and Sligo, only a 10 minute drive from my hometown Ballina, Co. Mayo, and less than an hour from Sligo, Westport, Knock and some of Mayo and Sligo’s famous landmarks. The quirky glamping village is only 200m away from the hotel and David McGowan’s Boeing 767 can been seen as you drive by. “The Big Yoke” has put Enniscrone on the map after sailing the plane on a barge up to Sligo! 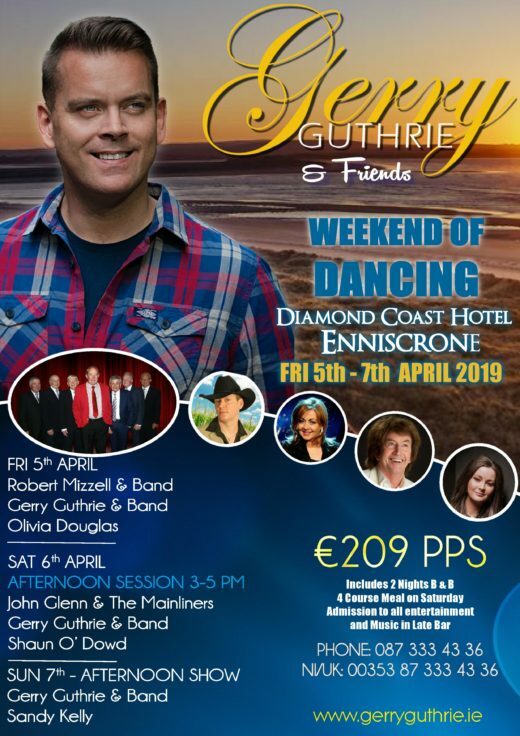 I will be joined in Enniscrone by some of Ireland’s greatest entertainers including Robert Mizzell, Sandy Kelly, Shaun O’ Dowd, Olivia Douglas and the legendary John Glenn & The Mainliners.. As usual, we’ll have a few surprise guests aswell!